Analysts who track the IaaS public cloud computing market tend to agree that 2016 was a year that solidified the positioning of three vendors: Amazon Web Services, Microsoft Azure and Google Cloud Platform, and marked a major transition point in enterprises using them. These companies gave customers more choices of where to host their data around the globe, more virtual machine instance sizes to optimize their workloads and new ways to manage and analyze data that’s already in the cloud. And enterprises became more and more comfortable using them. More companies committed to shutting down data centers and moving their most important applications to IaaS. On a macro level, Forrester Research estimates the cloud market overall is expanding at a 22% compound annual growth rate and is expected to hit $146 billion by the end of 2017. That’s up from $87 billion in 2015 and the market’s on its way to $236 billion by 2020. Infrastructure and platform clouds are expected to be a $32 billion market in 2017, growing at a 35% CAGR, which is faster than the SaaS market. AWS could hit $13 billion in revenues, while Forrester believes Microsoft Azure is about two or three times smaller (Microsoft does not break out its Azure revenues) and Google is between a half billion and $1 billion. “We had to update our forecast,” says Forrester analyst Dave Bartoletti. “It’s growing faster than we expected in 2014.” Cloud is being adopted at a faster rate than virtualization was back in the day. Expect this meteoric growth to continue through 2017. Given this massive growth, IDC Chief Analyst Frank Gens believes the industry is at the dawn of a Cloud 2.0 stage. It’s moving beyond experimentation toward mass enterprise adoption. By 2018 Gens predicts that 60% of enterprise IT workloads will be off-premises; 85% of enterprises will commit to a multi-cloud architecture model and by 2020 over 70% of cloud service provider revenues will be mediated by channel partners/brokers. “Even for those enterprises already familiar with the cloud, it will be a new challenge to get ready for these significant changes in what clouds are, and are able to do,” Gens says. “The market's assumptions about (and use cases for) the cloud — as it becomes more distributed, trusted, intelligent, and industry specialized — will greatly expand." If there is one trend that is expected to dominate cloud vendor priorities in the upcoming year it is machine learning and artificial intelligence. All three of the major vendors made big announcements in 2016 related to this field. Google released TensorFlow, an open source machine-learning platform. Microsoft introduced a cloud-based platform for machine learning and Amazon announced three new machine learning services at is re:Invent conference. Expect the drumbeat of ML and AI news to continue into 2017, with this technology becoming easier for everyday developers to use and integrate into applications they’re building atop these cloud platforms. A trend that kicked off in 2015, gained traction in 2016 and is expected to continue to ramp up in 2017 is serverless computing. It’s the idea of building applications that run without provisioning any infrastructure resources. Code is triggered by events – an IoT device uploading information into a database, for instance. The serverless computing platform will then execute a corresponding action: making a copy of that database entry in a data warehouse, for example. Whole applications can be built this way. AWS’s Lambda platform debuted in 2015 while Microsoft made Azure Functions generally available in November and IBM made its OpenWhisk serverless computing platform (which is also an open source project) generally available in December on the BlueMix PaaS. It’s still early days for serverless computing, but expect more and more use cases – especially around the Internet of Things - to emerge in 2017. While serverless computing and machine learning have been popular in 2016, containers may have been the buzzword of the year for cloud vendors. 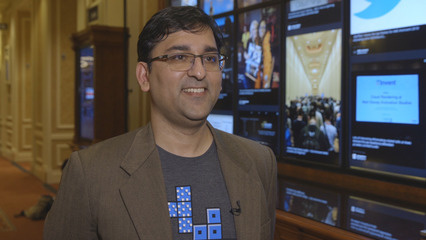 IDC IaaS analyst Deepak Mohan lumps serverless computing and containers into a category of “next-generation computing,” which moves beyond the traditional construct of virtual machines and servers. Expect 2017 to be a year where container management platforms – orchestrators like Kubernetes and specific tools to help with container networking, security and storage gain market presence and enterprise interest. Cloud vendors are offering their own platforms for doing this – Google has its Container Engine, AWS has the Elastic Container Service and Microsoft has the Azure Container Service. Bartoletti says only about 10% of enterprises use containers in production now, but up to a third are testing them. Expect their use cases to crystalize in 2017. Not all the action is in the public cloud. Tectonic shifts are occurring even within the realm of on-premises infrastructure. “In 2017, the private cloud market will aggressively shift away from traditional private cloud suites toward leaner, cheaper solutions that include and integrate PaaS capabilities, cloud management, and container support,” Forrester Research predicts in its look ahead to 2017. Private clouds will increasingly be built atop hyperconverged platforms – infrastructure that comes prepackaged with compute, network and storage. Or there are other models like private-cloud as a service, where the vendor controls the infrastructure and software, but it sits behind a customer’s firewall. One specific piece of news to watch is Microsoft’s introduction of Azure Stack – a converged infrastructure offering meant to be compatible with the Azure public cloud. It’s expected to be generally available sometime in 2017. Even as organizations build out next-generation infrastructure for their private clouds, they want a way to enable workloads running on that infrastructure to eventually run in the public cloud, thus creating a hybrid cloud. Hybrid cloud computing has been a staple of Microsoft’s cloud strategy since it launched Azure. AWS has mostly ignored the idea of private and hybrid cloud computing, but it released a series of products and services to on-ramp data on to its cloud at re:Invent 2016. These include a new Snowball Edge device that can do local computing and then send data to AWS. Snowmobile is the most dramatic example -- it’s a 45' container that can literally truck 10 Petabytes of data at a time into AWS. Watch for how Google talks about its hybrid cloud strategy in 2017. So you’ve got workloads in the cloud, and you plan on adding more. Now you’ve got to manage your cloud usage. Forrester says it’s the customer’s responsibility to manage IaaS resources. Make sure you’re not overprovisioning virtual machines; ensure that unused VMs are turned off; pre-purchase as much capacity as possible to save money; make sure access controls are protected with multi-factor authentication; automate as much as possible to ensure consistency, improve efficiency and reduce human error. These are just some of the ways that users of IaaS platforms manage their clouds. There are a growing number of vendors that will help customers manage their use of any cloud platform. Expect the market for these tools to grow with adoption. Either educate yourself on best practices for using the cloud, or find someone who can help you make sure you’re using this technology the right way. As the IaaS cloud computing market continues to grow by leaps and bounds, vendors are quickly building up data center space around the world to keep up with demand and customer requirements. But it’s not just for scale that vendors are building out the cloud -- they’re also adding data centers in specific geographic regions to comply with local data sovereignty laws. Expect the drumbeat of new regions, availability zones and data centers to continue in 2017. Google, for example has announced plans to more than double its footprint of cloud regions. Check out an interactive map of where cloud providers have data centers around the world here. 10. Market consolidation – will there be just three? How settled is the IaaS cloud market? Mohan, the IDC analyst, says that answer depends on your perspective. In the U.S., the market is well-defined and he believes it would be difficult for new players to take significant share. “Outside of the U.S., it’s a very fragmented market,” he says. Vendors like Alibaba and Tencent in China have opportunities to grab large market shares in these localities. Will that potential international strength translate into the U.S. market? 2017 could provide some clues.